Just last year alone, American consumers spent at least one billion dollars per month more than they needed to on wireless services. On the average, consumers pay up to $1,500 per year on their wireless bills. Avoid contracts! Buy a contract-free phone! With a two-year contract, you lose money, freedom and convenience. Wireless carriers lure consumers with a ‘discounted’ phone but make them sign overpriced and restrictive contracts that end up costing them more than $1,000 extra over the life of the contract. Insurance plans on contract free phones are the same. It is true that when you buy a contract free phone you have to pay full price rather than the subsidized rates that carriers offer for a locked phone on a contract. However, that’s the trick: those contract deals are deceptive because the consumer ends up paying more than what the phone is worth, and then some in fees. In the long run, the contract-free phone will save you money. Instead of paying $100-$200 per month for your wireless plan, you can pay $40-$60 for an all-inclusive, unlimited plan that includes voice, text, and data (email and web surfing). Contract free services are offered by some of the bigger contract-based carriers (like T-Mobile) and by carriers that solely offer service without a contract (like Simple Mobile, Boost Mobile, and h2O Wireless). Most of these smaller carriers are known as “Mobile Virtual Network Operators” or MVNO’s. This is because rather than having their own network they actually use the network and wireless infrastructure owned by the four large carriers, which includes Verizon, T-Mobile, AT&T, and Sprint. The advantage of this is that you get access to the reliable network coverage of a large carrier without getting stuck in an unfair and restrictive contract. The few “contract-free-only” carriers that use their own network include MetroPCS and Cricket Wireless. This comparison tool shows you just how much you can save per month by switching to a contract-free service. 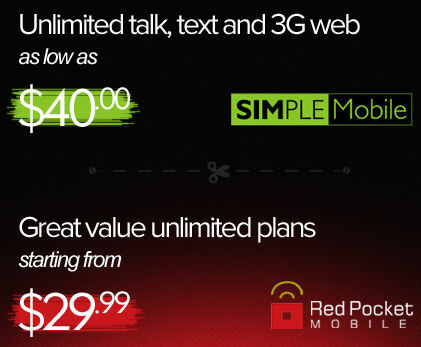 Just enter how many minutes you use, your text and data plan to instantly compare the prices of different carriers. Visit gsmnation.com/savings-calculator for instant savings. Apple products are the crème-de-le-crème, but their marketing success has actually created an opportunity for consumers. Other amazing similar high-end products had to dramatically lower prices to compete. Visit objective information centers to talk about YOUR needs and pick the best product for YOU. You can find world-class smart phones for under $150 and tablets for under $300. When choosing wireless products and services, visit online digital communities such as GSM Nation, Engadget and Gismodo to see product reviews and forums, and to get feedback from experts, other customers and objective parties.